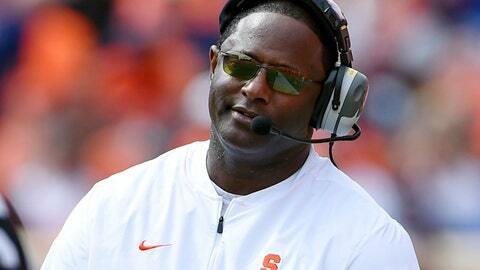 PITTSBURGH (AP) — Syracuse coach Dino Babers believes the culture within his program is changing. That the days of the Orange settling for simply being competitive are gone. Babers sees proof everywhere, from the warp speed offense led by senior quarterback Eric Dungey to a defense that has evolved from meager to occasionally menacing. Saturday’s visit to struggling Pittsburgh (2-3, 1-1 Atlantic Coast Conference) offers Babers and his team a chance to see just how grown up the Orange have become, on multiple fronts. Winning at Heinz Field — where Syracuse (4-1, 1-1) hasn’t triumphed since 2001 — is typically hard enough. Now the Orange will have to do it while trying to recover from the emotional fallout of a draining loss to ACC power Clemson last Saturday. Syracuse led the Tigers by 10 points on the road with 13 minutes to go only to surrender the winning touchdown with 41 seconds left. And do it quickly if the Orange want build on the momentum of their hot start. Syracuse hasn’t won more than four games in a season since 2013, the last time it qualified for a bowl game. A victory over the struggling Panthers — who have dropped three of four — would top that total in early October and perhaps more importantly send a message to the rest of the ACC that this is not the same old Orange. Dungey called it “the biggest week” the Orange will have all season. It may be that for the Panthers too. Pitt was pushed around last weekend by No. 12 Central Florida in a 45-14 defeat and faces a daunting visit to Notre Dame next weekend. While quarterback Kenny Pickett stressed “everybody’s head is right” the sophomore is also well aware the offense needs to get it together. Pickett watched from the stands as a recruit two years ago as the Panthers beat Syracuse in a bonkers 76-61 contest that set a record for the highest scoring regulation game in FBS history. Now Pickett leads an offense that has scored 79 points total in four games against FBS competition this year. That’s not going to cut it if the Panthers want to reach a bowl game after missing out in 2017. Syracuse is averaging one play every 21.6 seconds of possession time, and of the Orange’s 37 scoring drives, 29 have lasted fewer than 3 minutes, and 19 have been fewer than 2 minutes. The Orange lead the ACC with six scoring drives under 1 minute. Top-ranked Alabama leads the nation with 12. The Panthers believe they’re prepared to keep pace with the Orange after facing Central Florida, which ran off 91 offensive plays. Narduzzi brushed off criticism by Central Florida coach Josh Heupel, who suggested the cramping issues that Pitt experienced was a bit of gamesmanship in an effort to slow the Golden Knights. The Orange have averaged 4.7 sacks over the last three games — against Florida State, Connecticut and Clemson — and they’ve either hurried or sacked the quarterback on 24 percent of 95 dropbacks. DE Kendall Coleman leads the ACC with six sacks, just ahead of linemate Kendall Coleman (5). “They’ve got big dudes that can play,” Pickett said. The best way for Pitt to slow Syracuse might be to rely on the legs of running backs Qadree Ollison and Darrin Hall. Babers knows his group needs to be wary after Clemson’s Travis Etienne piled up 203 yards rushing and three scores last week.